Explore the flavours, scents and sounds of a Bangkok street food market with our new look Thai range. 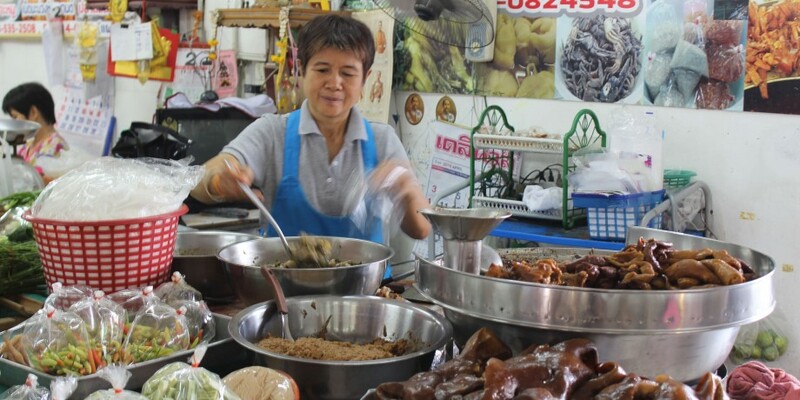 From Banglamphu to Chatuchak, tucked between the bustling roads where pink taxis whizz by, are streets lined with stalls overflowing with delicious treats. From Tom Yum Soup, to Green Curry, there is a tasty Thai street food for every occasion. Tom Yum Soup is a Bangkok staple. Exploring the city’s streets you’ll come across street food cooks boiling big batches of broth, just waiting for an order for Tom Yum to come in so they can fire up the burners! Hot, sour and packed with herbs and spices, our recipe gets its subtly fiery flavour from our Thai Red Curry Paste. It’s perfect as a starter or as a tasty lunchtime snack. Pad Thai is a street food favourite. Our super-easy version can transport you to Ratchawat Market in just 15 minutes. We use Wholewheat Noodles instead of the traditional Rice Nooodles for extra bite. Just stir fry your noodles with prawns, Sweet Chilli Sauce and a few flavourful extras then top with crunchy peanuts and aromatic coriander. Nothing says Bangkok street food like a Thai Green Curry. Our authentic Paste Pots are made in Thailand with galangal, lemongrass, garlic and shallots blended with green chillies, which give the curry its colour and fiery flavour. To make an authentic you’ll-think-you’re-in-Bangkok curry, just stir fry that Paste to release the zingy aromas and add Coconut Milk, veggies and prawns. Then tailor to your taste buds with Fish Sauce or Palm Sugar. So travel to Thailand this evening! Don’t worry about packing. Your adventure starts in your kitchen with Blue Dragon.